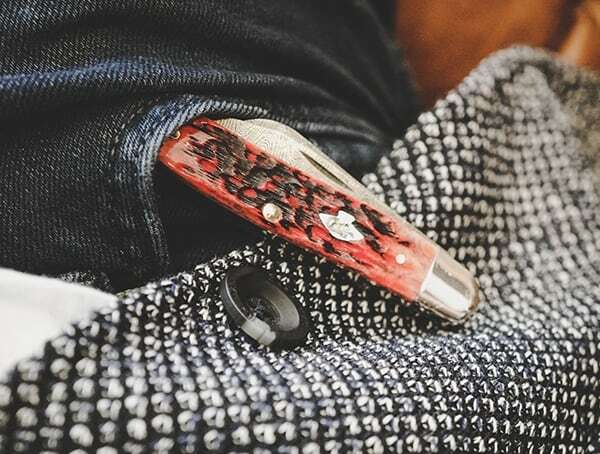 America’s heritage is often found in the details, the everyday and oft-overlooked items men have carried with them for generations. 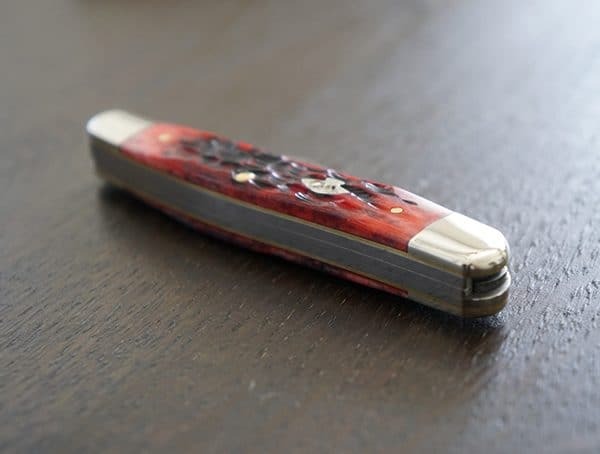 These indispensabiles prove that any job worth doing is worth doing right, and when it comes to Case knives, no other motto could be more fitting. 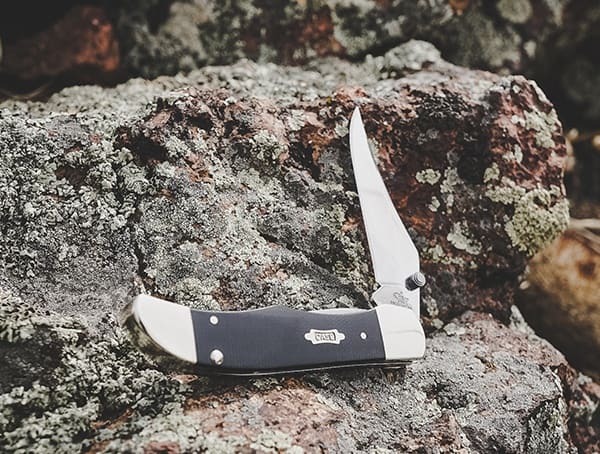 Built with the integrity of the task at hand, Case knives have been accompanying the hardworking man for over a hundred years, with another hundred destined to follow. 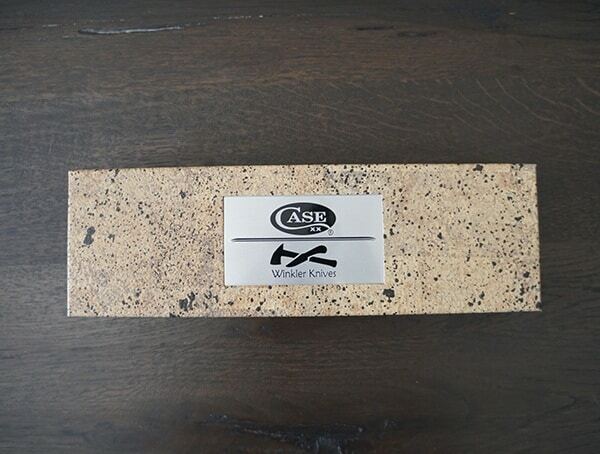 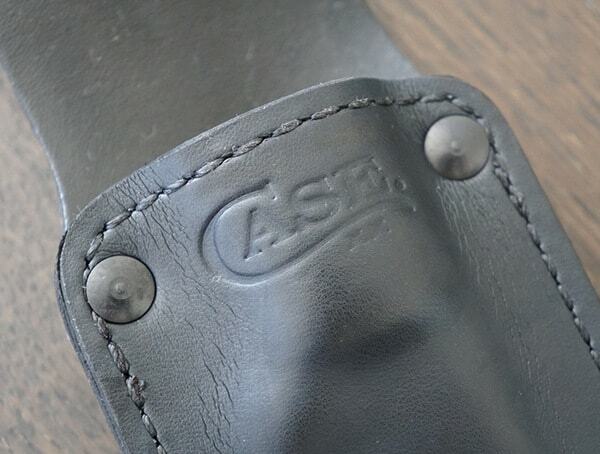 Case knives are crafted from only the finest materials, and test twice for assured durability. 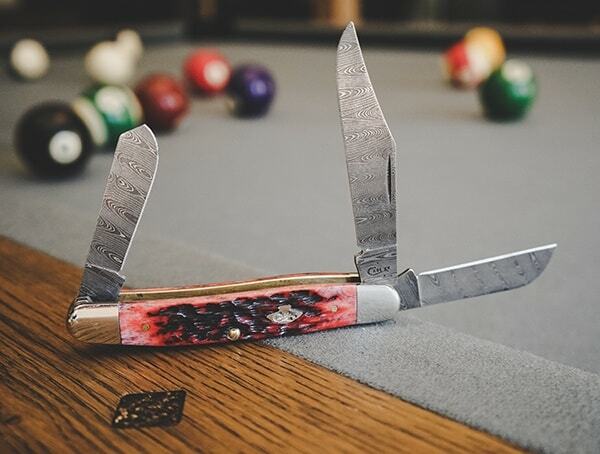 This has been the Case way since its early days on the American frontier, and many of its knives have been passed down through generations, boasting a fanbase that includes U.S. presidents, country music stars, and bull riders. 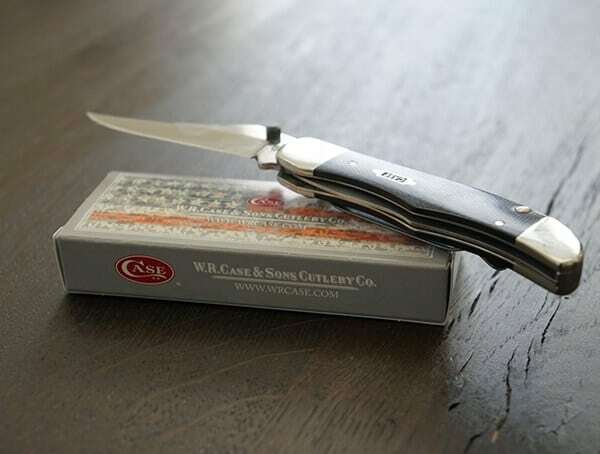 Owned by Zippo Manufacturing Company today, a family owned business owing their own legacy to the famed Zippo windproof lighter, Case continues to enjoy a reputation as the definitive American blade. 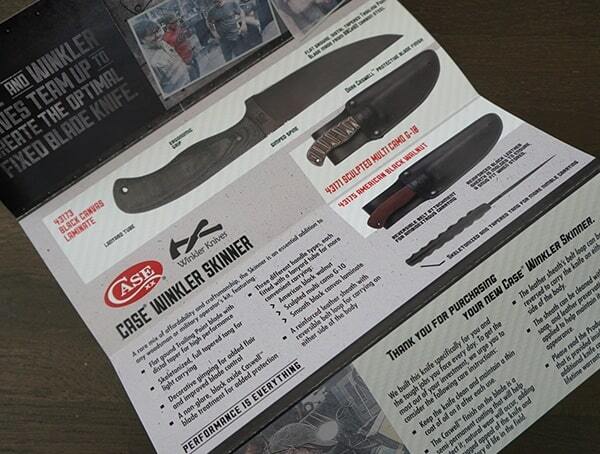 No matter how great or small the aforementioned task, Case knives spare no effort when it comes to providing a sleek, up-to-date, and high performing blade that will serve you in good stead year after year. 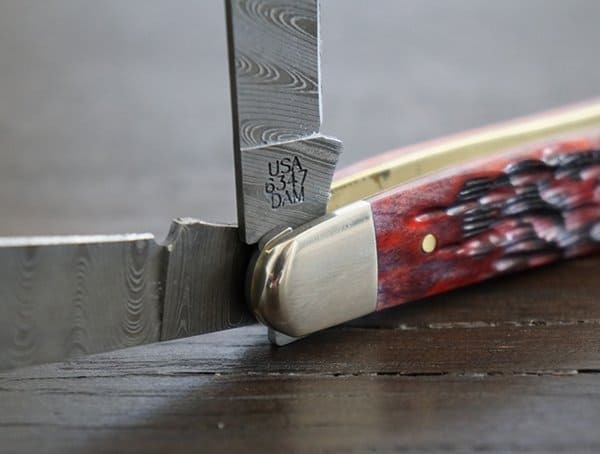 America’s finest brands were founded during times of exploration and expansion, and that quality of spirit continues to accompany the Case knife-carrying man. 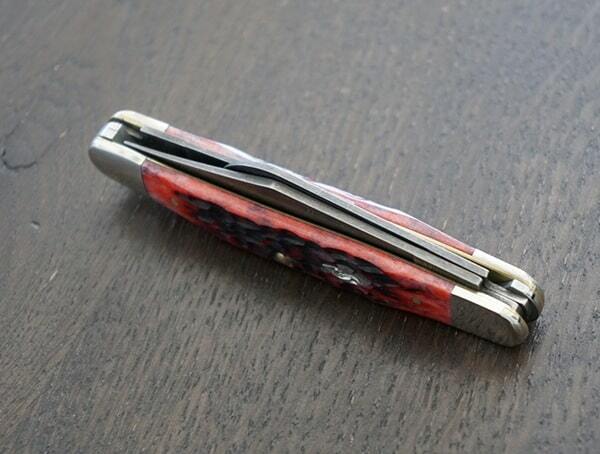 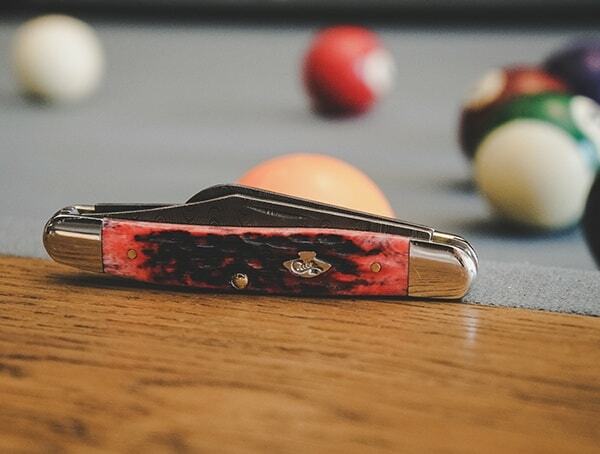 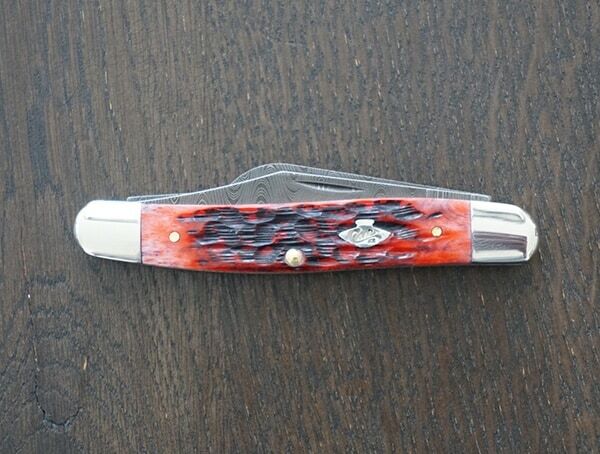 He knows that what he carries is more than just a simple tool to impress; his Case knife honors the hard work, dedication, and ingenuity that defines the American vision. 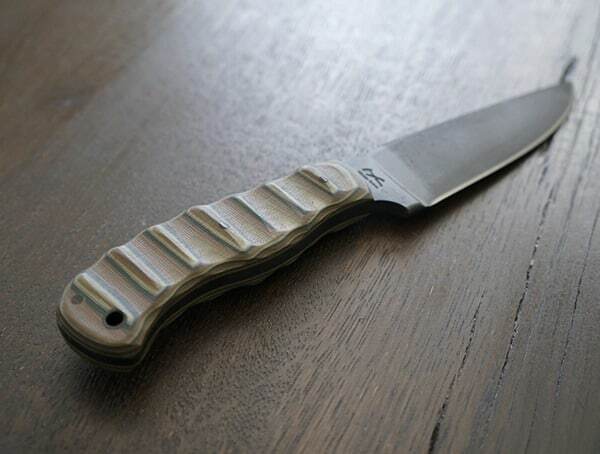 – Available in Multi-Camo G-10, wood American black walnut, and synthetic Winkler black canvas laminate options. 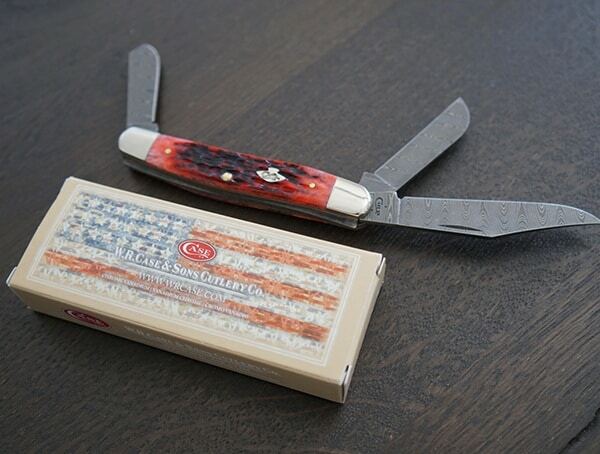 – Made in Bradford, PA USA from domestic and imported materials. 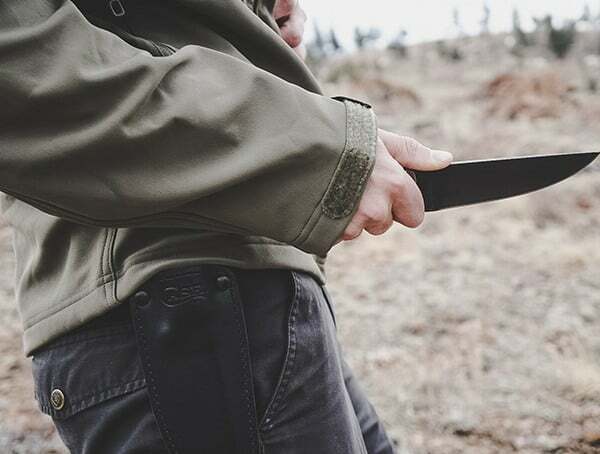 Collectively crafted by both Case and Winkler Knives, the Case Winkler Sculpted Multi-Camo G-10 Skinner Knife is a high performing field knife that is extremely lightweight, well-balanced, and dependable. 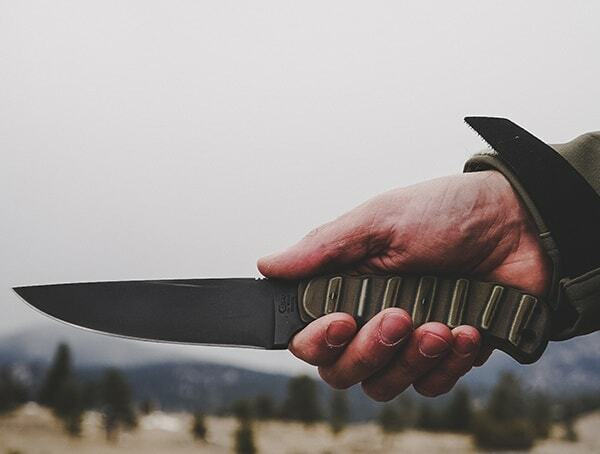 It was specially designed by retired United States Army Special Operator and Navy SEAL, Kevin Holland and master bladesmith, Daniel Winkler, so you can count on maximum performance, precision, and durability. 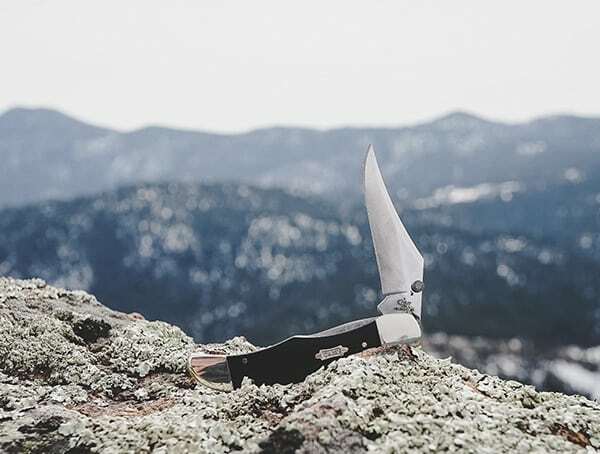 The trailing point blade is ideal for digging and piercing because of its fine blade tip, and its strong sweeping edge shape makes it the perfect outdoor tool. 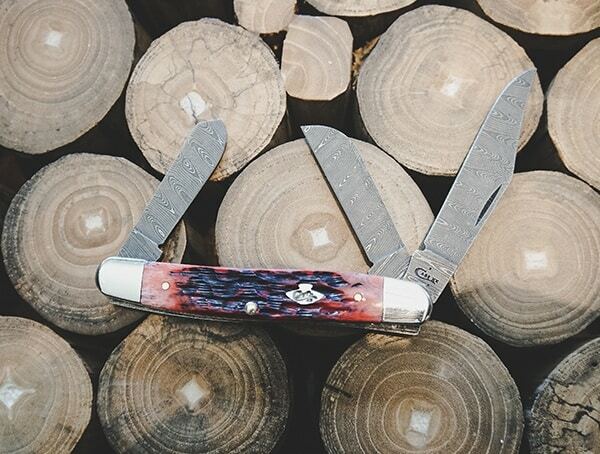 It’s superb for skinning, long cuts, and practically any other task you need done. 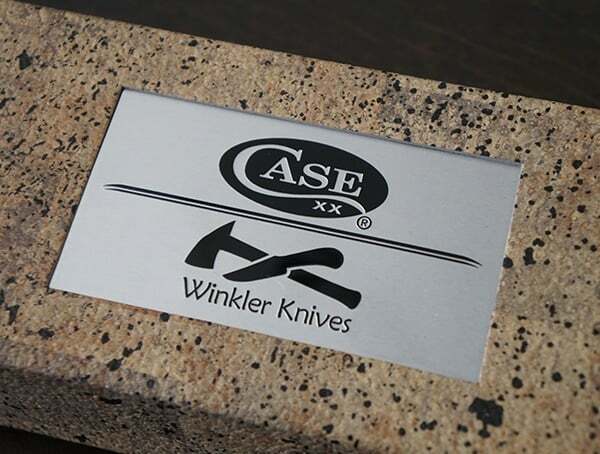 Its distal tapered, flat ground trailing point skinner blade with black oxide and a Caswell finish is comprised of 80 CrV2 steel. 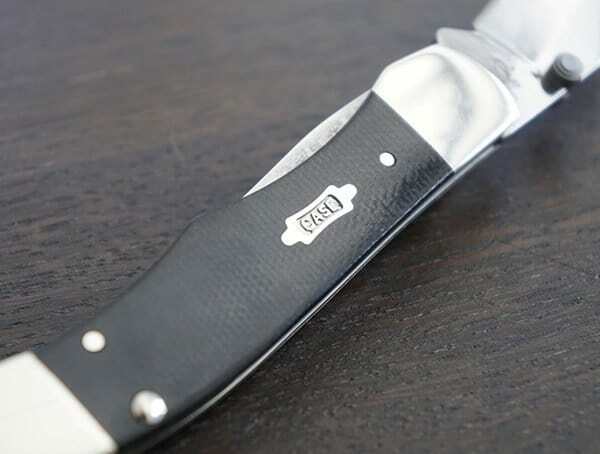 80 CrV2 steel is famous for its resilient and durable lateral strength, fantastic edge retention, and its easy to sharpen structure. 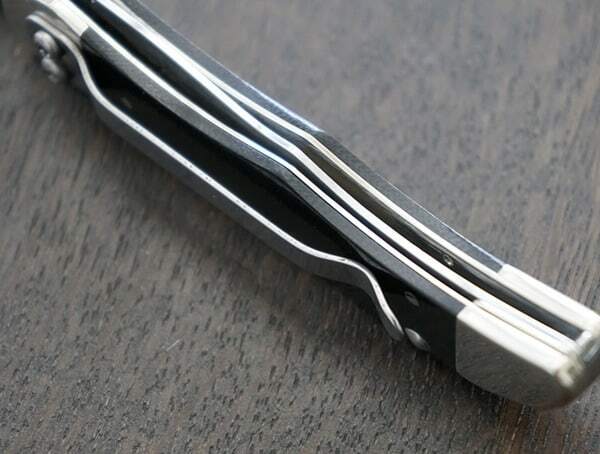 So not only do you get optimal performance, but maintenance is also minimal. 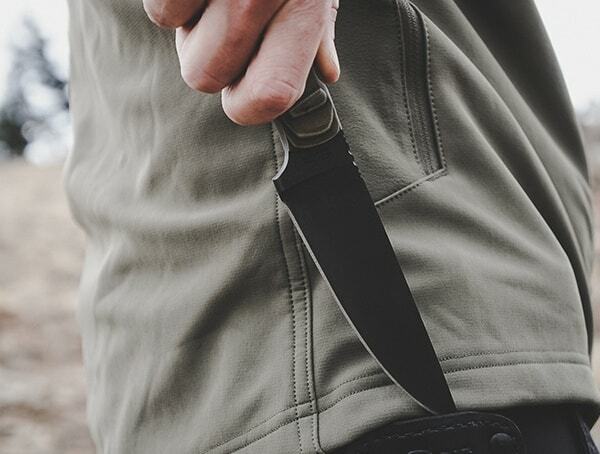 This fixed blade knife features a stylish yet resilient sculpted, layered, and then sanded multi-camo G-10 handle with comfortable finger grooves for added grip, dependability, control, and precision. 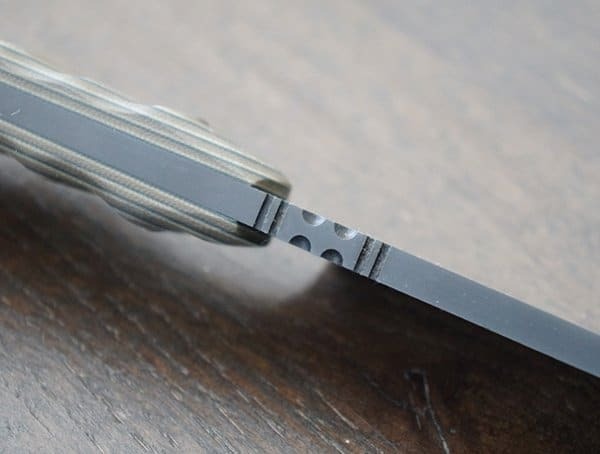 The full tang is tapered and skeletonized for maximum lightweight feel and ideal balance. 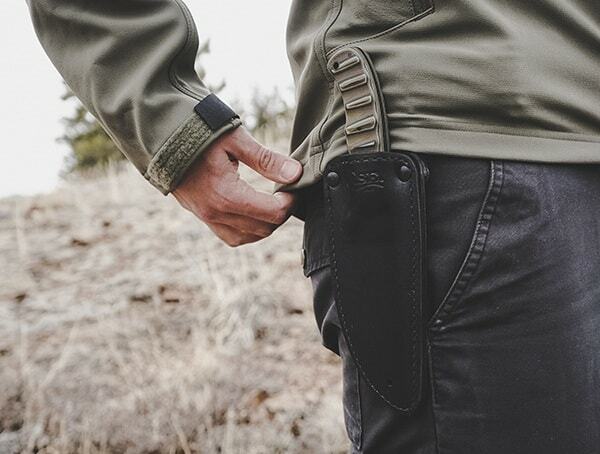 It also stores easily and comfortably in your pocket. 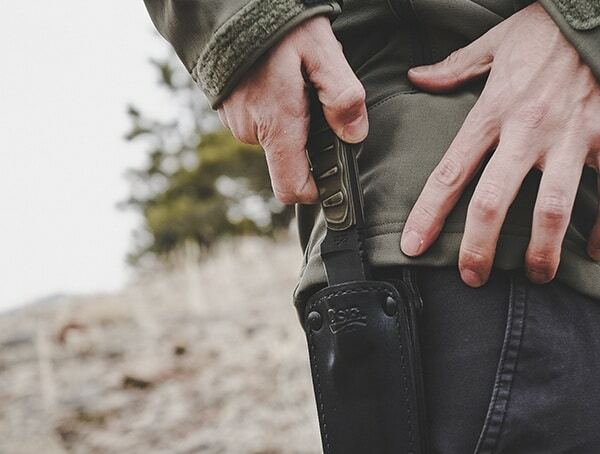 For added versatility and convenience, it features a reversible belt attachment, so you can store it on your left or your ride side. 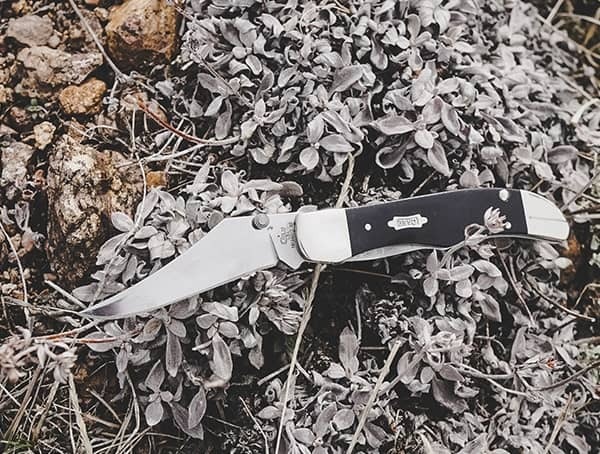 The Case Winkler Sculpted Multi-Camo G-10 Skinner Knife includes a fashionable sheath made of specially reinforced molded black leather that provides a perfect snug fit and will not lose its shape. 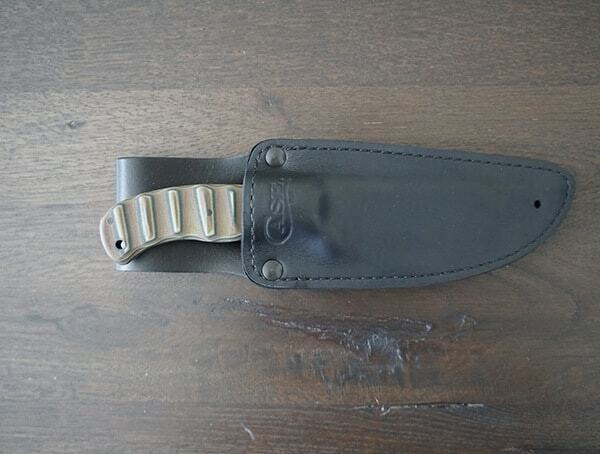 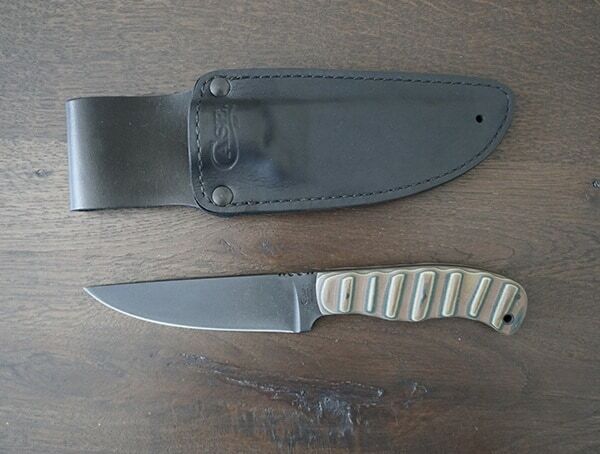 The knife measures 9.63 inches in length overall and weighs 6.7 ounces. 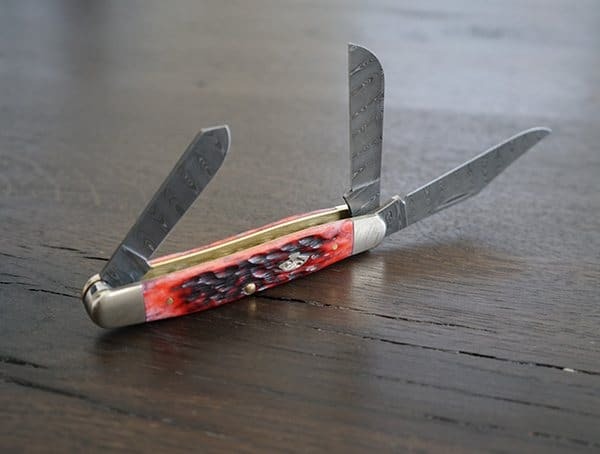 Weighing 2.9 ounces and perfect for any occasion or task, the extremely useful and versatile Crimson Bone Peach Seed Jig Stockman Knife includes three blades, a clip blade and a sheepfoot blade on one end, and a spey blade on the other. 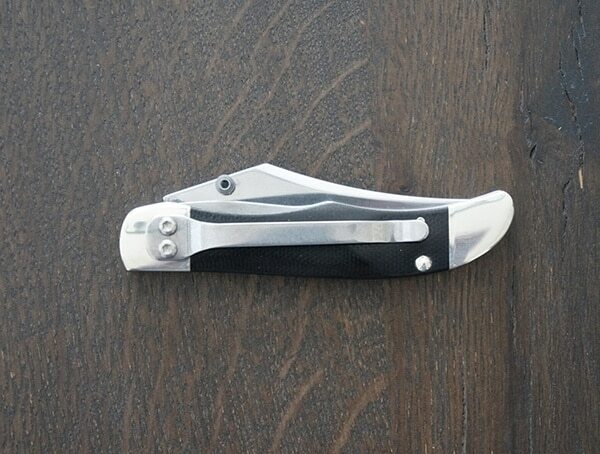 The multipurpose clip blade provides detailed work ideal for carpentry and carving. 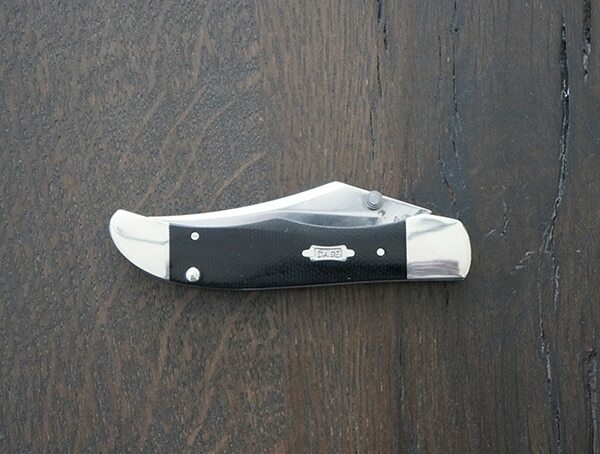 Its sheepfoot blade, originally designed to trim sheep’s hooves, features a curved back and a straight edge, and its strength at the point makes it perfect for carving, as well as for an extraordinarily clean cut. 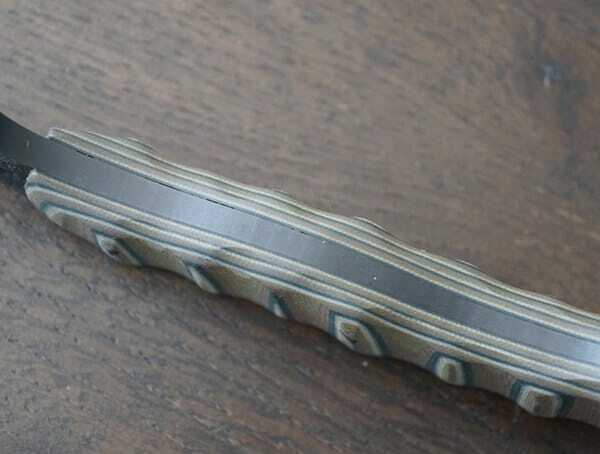 Its strength will surely surprise you. 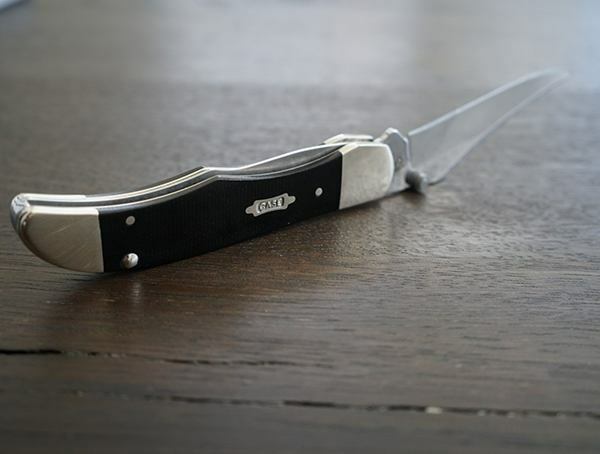 The spey blade proves to be great for skinning as well as for all purpose utility work. 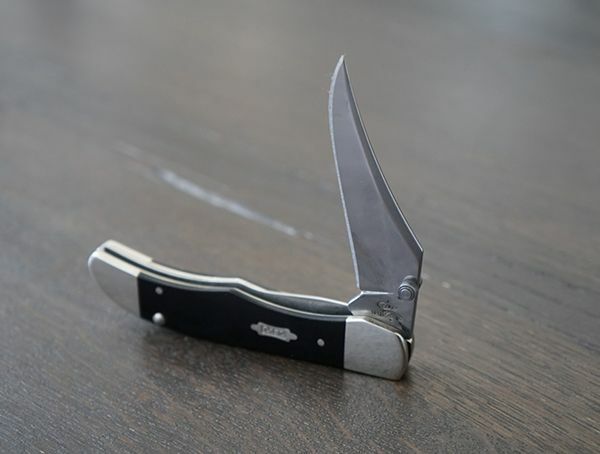 It has been commonly and effectively used by ranchers and farmers for centuries, so you know it’s a knife you can trust. 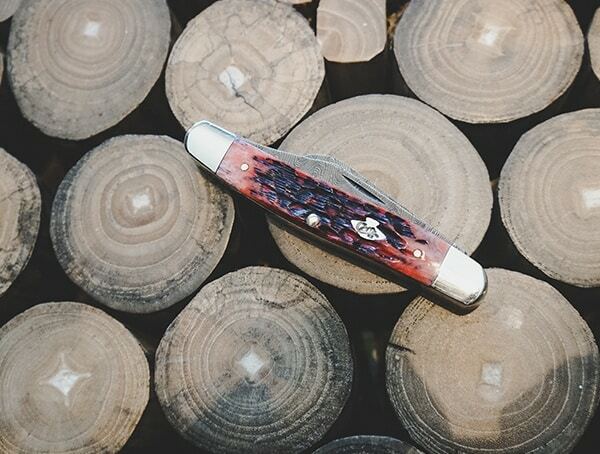 The Crimson Bone Peach Seed Jig Stockman Knife’s stylish handle features an beautifully unique peach seed jig that is sure to turn heads. 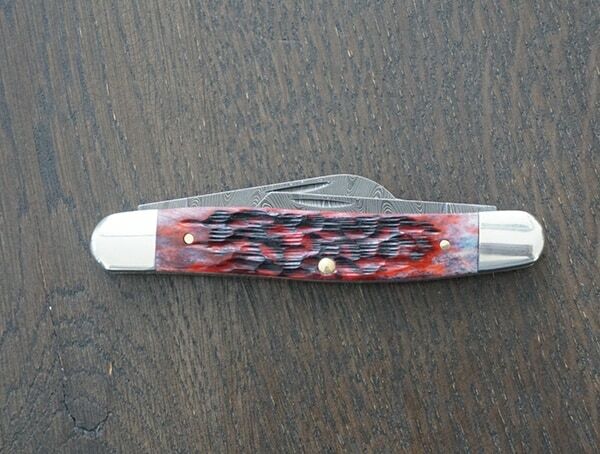 The handle’s exquisite design is one of a kind. 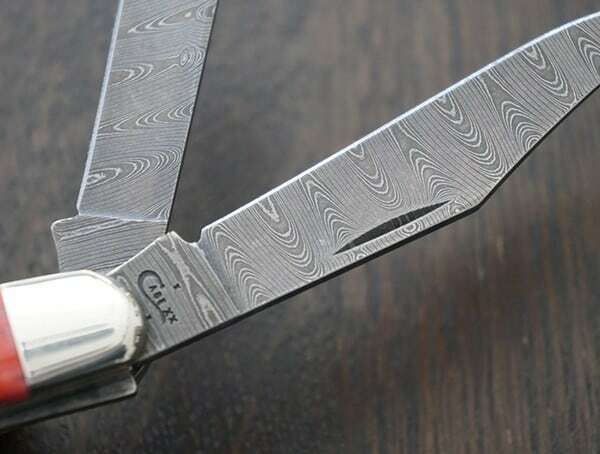 The blade is comprised of specially designed, mirror polished damascus steel. 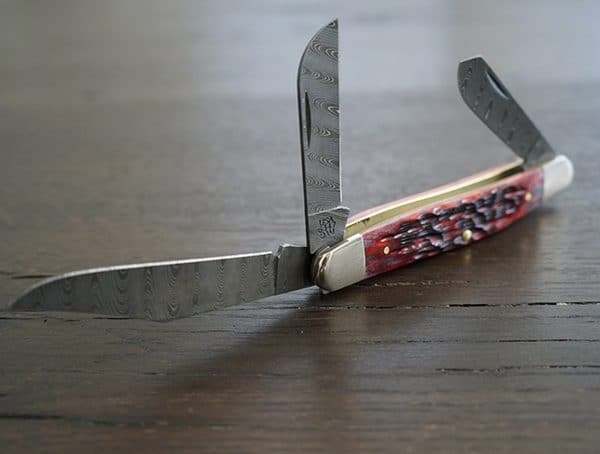 Closed, the knife measures 3.88 inches long, the clip blade measures 2.9 inches, the sheepfoot blade 2.1 inches, and the spey blade 1.9 inches. 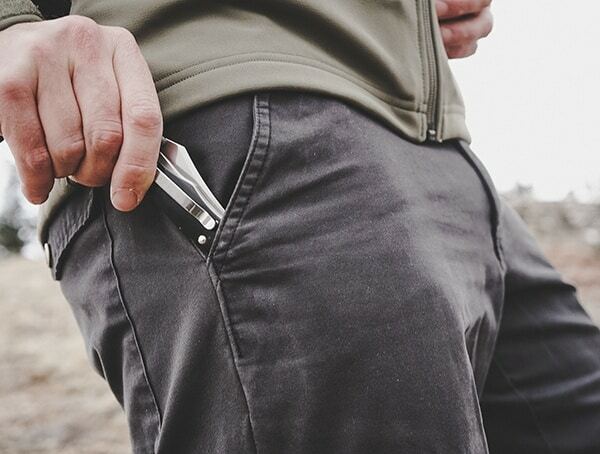 Even packed with gargantuan power and capability, its sleek shape fits easily and comfortably in your pocket. 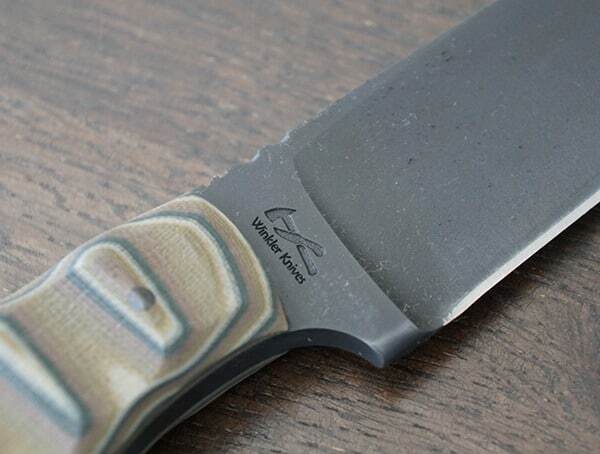 Choosing this knife is definitely a decision you will not regret. 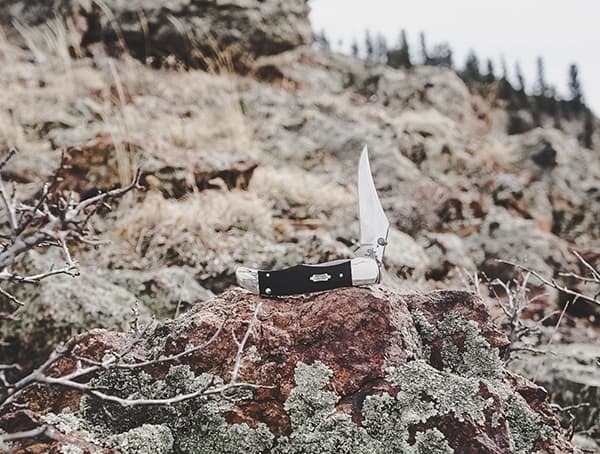 Its three blade design is perfect for whatever task you need it to accomplish. 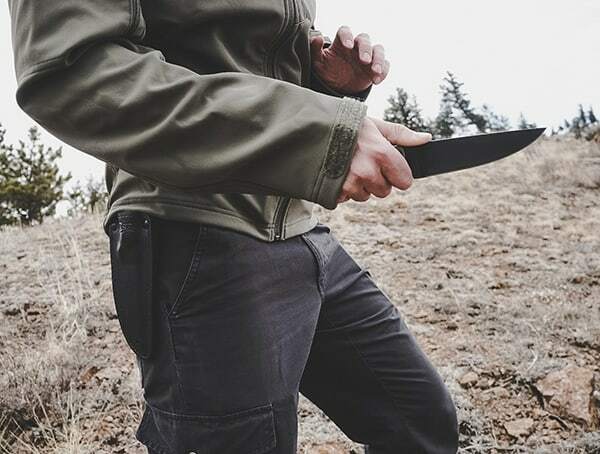 It contains a different style knife for every occasion, each with strength, performance, precision, and comfort in mind, so you can always count on it, no matter what you’re faced with. 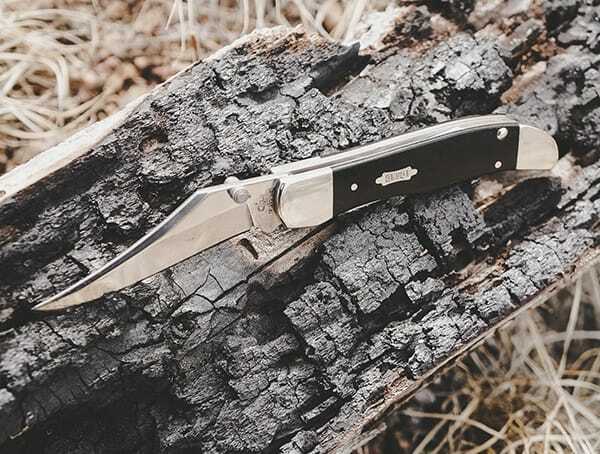 Ideal for use at home, at work, in the woods, on the ranch, at the farm, or anywhere in between, you can count on the Crimson Bone Peach Seed Jig Stockman Knife to get the job done, and get it done properly, comfortably, and safely. 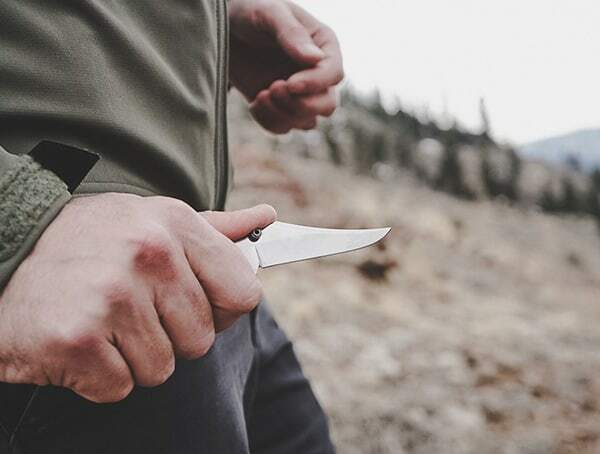 Perfect for fishing, camping, everyday tasks, and much more, the Kickstart Smooth Black Canvas Laminate Mid-Folding Hunter Knife offers excellent one handed control with its quick and easy blade deployment. 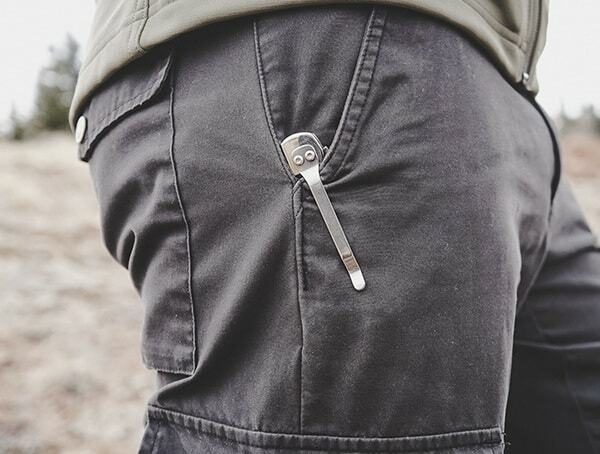 Just press the thumb stud and the patented Kickstart® assisted opening mechanism deploys the blade flawlessly. 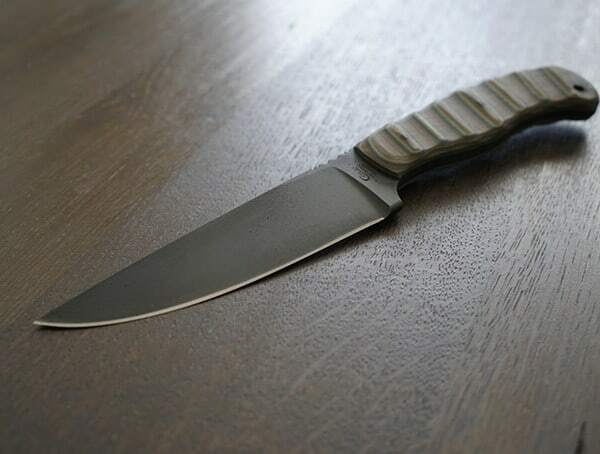 It features a smooth, scratch resistant black canvas laminate handle comprised of a special blend of synthetic material designed to endure the harshest of tasks and conditions. 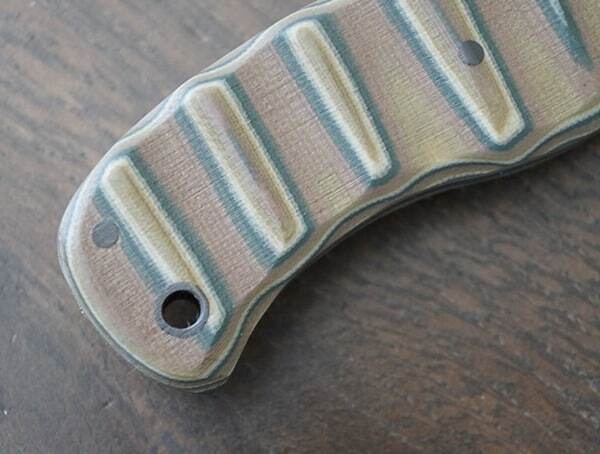 Available in four unique colors, black canvas laminate, patriotic kirinite, rough black, and yellow synthetic, the handle also features a textured grip for comfort and ease, and a bowtie shield for additional protection. 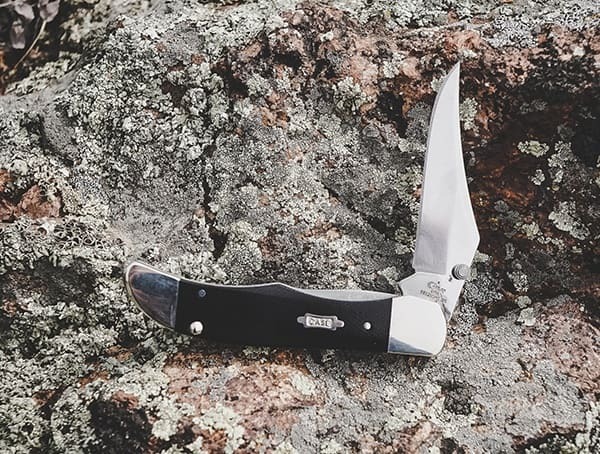 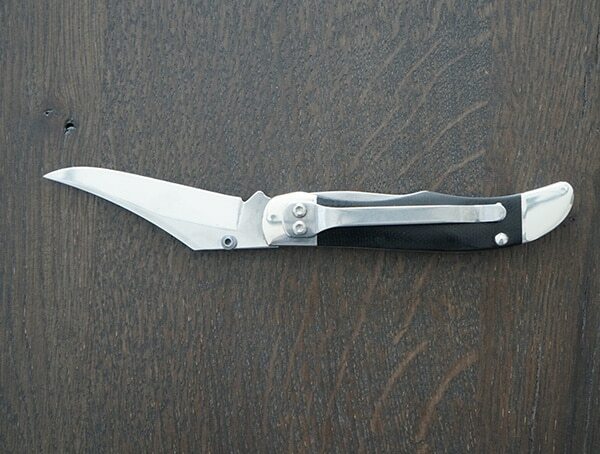 It includes a thumb stud, pocket clip, liner lock, and a versatile mid-folding hunter clip blade that can be used on practically anything you need. 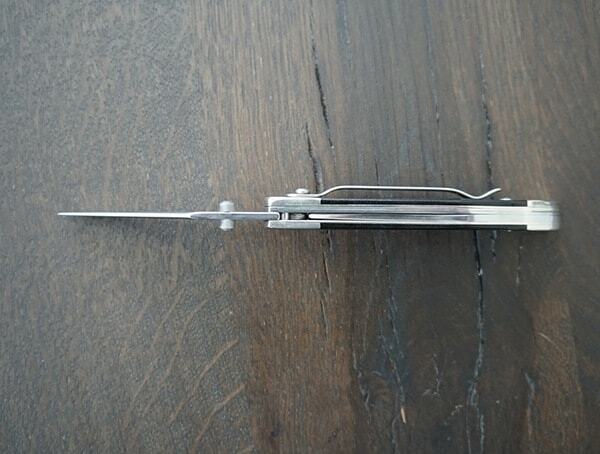 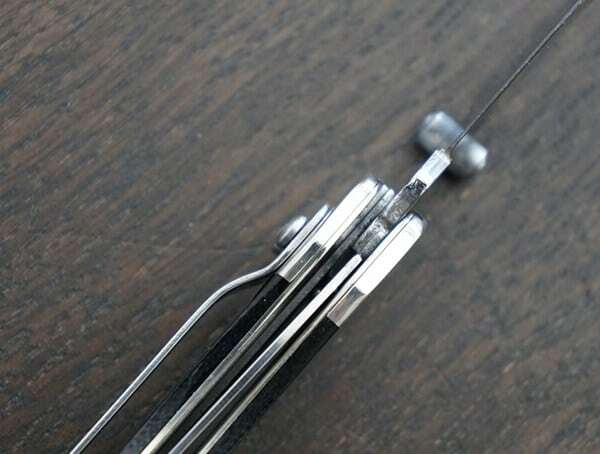 Its sharp point is perfect for piercing and the blade’s unique, specially designed shape offers superb cutting control and exceptional precision. 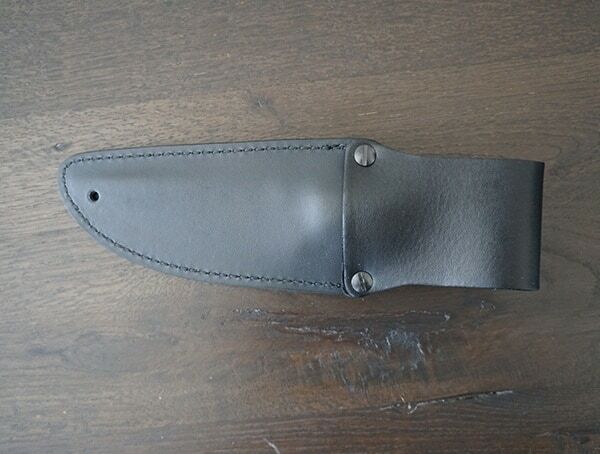 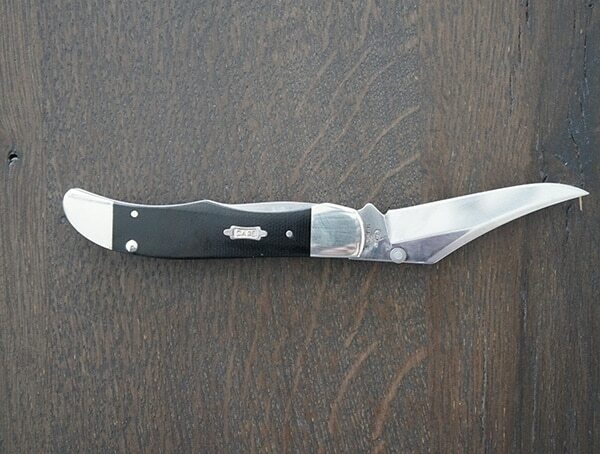 The Kickstart Smooth Black Canvas Laminate Mid-Folding Hunter Knife’s blade is made of mirror polished Case Tru-Sharp surgical steel, which is a specially created high-carbon steel that helps the blade stay sharp longer than conventional steel, and adds incredible strength, as well as corrosion resistance. 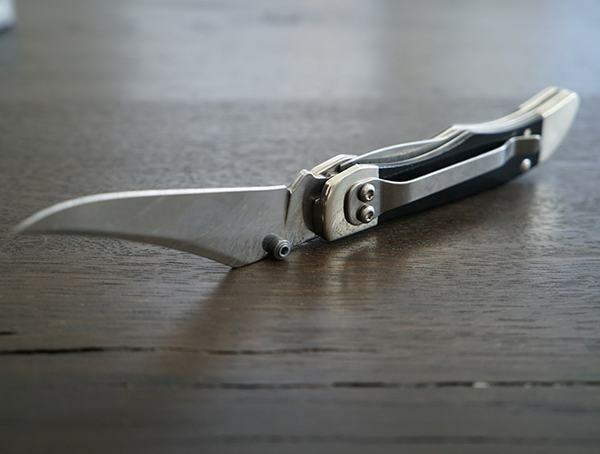 This blade will not let you down. 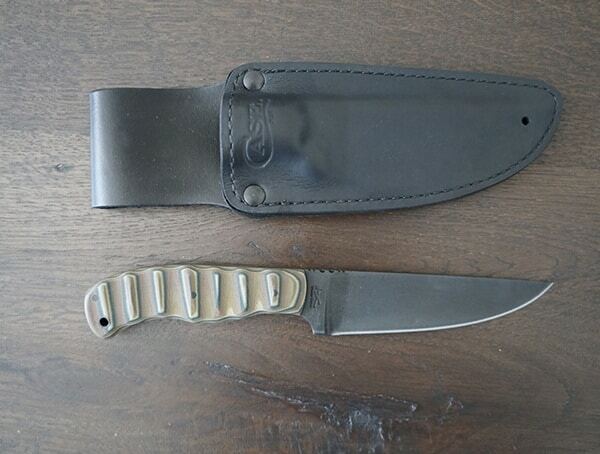 The blade measures 2.9 inches long, and the closed knife measures four inches and weighs 3.7 ounces. 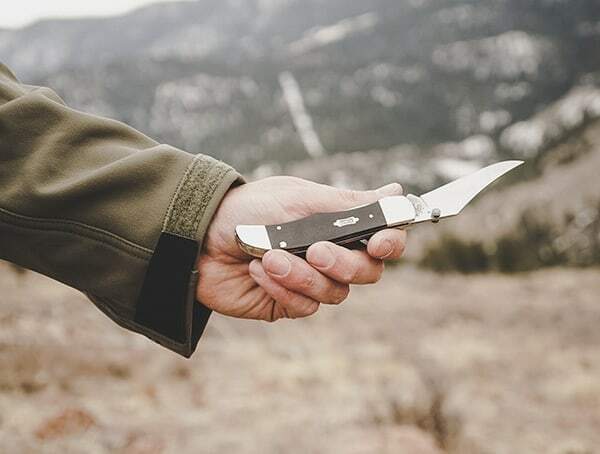 One thing you can count on is that this mid-folding hunter knife’s incredible strength and durability will surely impress you.